PRINCETON, N.J. – Nov. 15, 2017 – PRLog — As Thanksgiving approaches, we are reminded of all that we have to be thankful for and all that we may be capable of giving. Schools organize annual food drives and host Thanksgiving dinners for those in need. One particular Entourage school, John Witherspoon Middle School in Princeton, NJ has participated in the Students Change Hunger Campaign for the past four years and in 2016 won the Governor’s Cup for the entire state of New Jersey when they brought in over 8,000 pounds of food. In all four years of participating, the school has collected over 25,000 pounds of food as well as significant monetary donations. The Students Change Hunger campaign was launched by the Federation of New Jersey Food Banks in which schools throughout the state are challenged to organize food drives to help those less fortunate in their communities. From September 18th through December 11th, students, staff, teachers and parents are all encouraged to participate in collecting as much food as possible for their local food bank. Of the hundreds of schools who participate, only one will have the privilege of winning the Governor’s Cup. The Governor’s Cup recipient must demonstrate effort in the categories of Creative Promotional Campaigns, Engaging the Outside Community, Hunger Advocacy and Education Impact, In-School Special Events, and Student Leadership. We spoke with Food Drive Chair and Teacher Kelly Riely of John Witherspoon who explained how the students, faculty and parents of this middle school go above and beyond in their efforts to help their community. It is undoubtedly clear from their drive and selfless service why they achieved such an honorable recognition. Some of their creative promotional campaigns and in-school events include a homeroom competition, a “March Madness" team competition, bake sales, pretzel sales, and logo and slogan design contests. They have done food pyramids, assemblies, and participated in World Hunger Day. The Service Club ambassadors create fun games to get kids involved to donate in the mornings, like spin the wheel to end hunger. Students have even made public service announcements and website posts as well, using social media as an outlet to spread the word. Their campaign has been particularly successful due to the support of the community. Members of the civic minded-student group Do Something Club arrive at 7:45AM daily to collect, weigh, and record the food. They participate in bake sales, stand outside on cold days at local businesses to collect donations, and make posters and flyers which motivate their peers to get involved. Riely commends these students, “They are our future leaders, business owners, producers and doers. They are why we know America will continue to lead and do great things. These children possess a strong sense of self and others…their smiles, positive attitudes, relationship building and goodwill to man is simply beautiful. Spend one morning in JW with the Do Something Students and you will quickly find hope and all that is good in the world again." Parents help with spreading the word to the PTO and local businesses. Parent Sandy Moskovitz in particular reaches out to local businesses to host boxes and shares the school’s mission to stop hunger. Kelly notes, “Sandy is an incredible inspiration. She motivates and pushes us all to keep working on behalf of those who are struggling." Community PTO member Mary Beth Parker supports the pretzel sales and helps with the event. Last but not least, staff members and administrators work behind the scenes so large service operations can take place year in and year out. Teachers Ashante Thompson, Moriah Akrong, Amy Wargo and Vini DiFalco all work alongside the Do Something Club students and volunteer to help with major service events. The Custodial Staff works behind the scenes to keep the large operation of giving and collecting running smoothly. Patrick Cavanagh aided in the efforts to have thousands of pounds of food delivered and Mr. Walter Greer graciously collected and brought boxes to the students on a continual basis. Principal Burr is a true supporter of Service Leadership. His enthusiastic support helps to motivate and rally the students each morning with personal challenges and information announcements. On average, John Witherspoon raises 10,000 to 12,000 annually to support local organizations and those in need. Through a talent show, basket raffles, bake sales, and multiple school wide events, they have given and worked with dozens of organizations and supported multiple crisis victims around the world. The students, families and staff of John Witherspoon are believers in helping others and it is evident in everything they do. 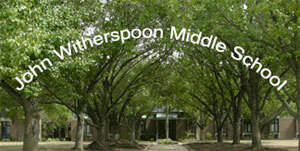 Entourage wishes to congratulate John Witherspoon Middle School for their outstanding commitment to their community. They will truly make a difference in the lives of others once more this holiday season and their giving spirit serves as an inspiration to all!